Water is the most vital resource for life on Earth; no living thing exists without it. Iziko Museums of South Africa will open a new exhibition, H2O Today, at the Iziko South African Museum on the 29th November 2018. The exhibition, organised by the Smithsonian Institution Traveling Exhibition Service (SITES), examines the diversity and challenges of water sources worldwide and promotes conversation, creativity and innovation through art, science and technology. H2O Today is part of the Smithsonian’s #ThinkWater Initiative to raise awareness of water as a critical resource for life. Using immersive content, interactive activities, and digital media, this international exhibition – supplemented with Iziko curated African content and collections objects – brings a global conversation at a critical time within the Western Cape context, having recently experienced the worst water crisis in living memory. H2O Today dives into what it means to live on a planet where 71 percent of the surface is covered in water, of which less than three percent is drinkable. The exhibition highlights water’s criticality in daily life worldwide through water power, industry, agriculture and home use. It explores the science of water from the hydrological cycle, weather and climate to its physical power as an architect and sculptor of landscape. The exhibition showcases global examples and striking imagery augmented with audiovisual material that tells the story of Earth as the water planet, water as our home, ways that water shapes culture, rising tides and sea level rise, and innovative solutions to some of the planet’s greatest water challenges. 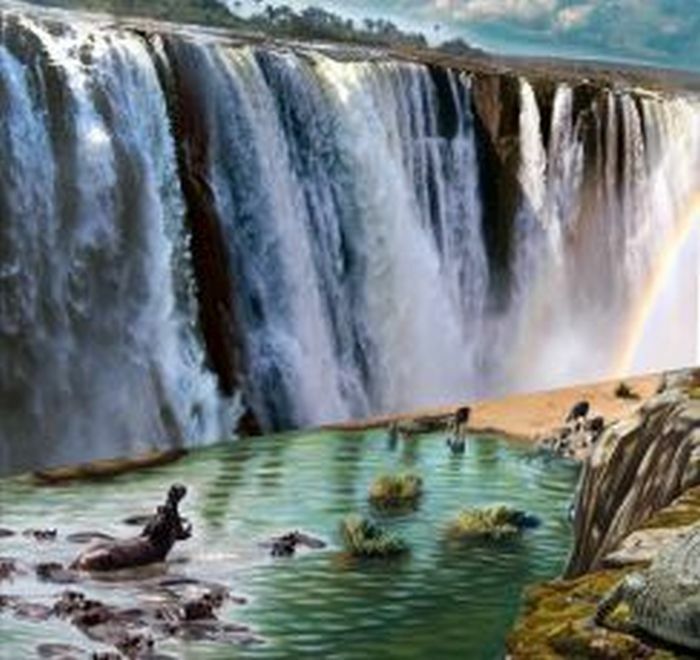 An immersive 3D artwork of Victoria Falls, anthropology objects that chronicle the evolution of the water canister from an ostrich egg used by the Khoi San to the plastic water bottles that we use today, a selection of iconic images that document Cape Town’s water crisis, specimens from Iziko’s collections that showcase the aquatic life of Table Mountain and the two oceans flanking it, and a time lapse of tidal waters that influence Cape Town’s rich marine biodiversity, presents an African and local context. “Water scarcity is not a uniquely Cape Town story – it is a shared global phenomenon. This exhibition brought to South Africa in partnership with the US Consulate in Cape Town, and the Smithsonian Institution is an example of a multi-dimensional relationship enabling an inclusive conversation at this critical time. It demonstrates how museums, through its exhibitions and programmes, can create awareness of relevant societal issues”, says Ms Rooksana Omar, CEO, Iziko Museums of South Africa. Unparalleled on the African continent, the Iziko South African Museum, situated in the prestigious precinct of the Company’s Garden, is the second oldest scientific institution in South Africa and an iconic Cape Town attraction. The museum is a hub of indigenous knowledge generation, heritage, biodiversity and science geared towards creating better understanding of the earth and its biological and cultural diversity, past and present.